Muddle the leaves from a mint sprig at the bottom of a Julep cup. Add the rest of the ingredients and ice. Garnish with mint sprigs and a float of 1/4 oz Gantous & Abou Raad Arak. A straw was later added upon request. For my next drink at No. 9 Park, I asked bartender Tyler Wang for the Electrical Storm Julep. 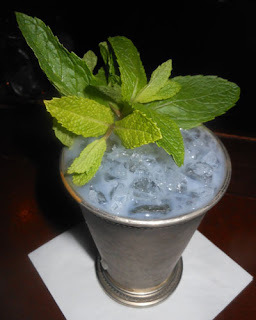 The Julep was another creation of bar manager Ted Kilpatrick, and similarly, I was not surprised that he had crafted it since Ted has made some quirky yet elegant Juleps before such as the Julep en Fuego. I am not sure whether the name is a reference to the cloudy louching effect from the arak or whether Ted suggests drinking these during summer thunder storms. The Electrical Storm Julep proffered a mint and anise bouquet. A malty sip shared a slightly citrussy note, and the swallow showcased the funky Jamaican rum, herbal notes from the mint and Genever, and cacao flavors from the liqueur.